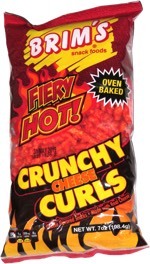 Taste test: Wow, these chips have zing! They look like ordinary potato chips, but take one bite and you'll find that they are indeed "quite hot" with some major mustard flavor. It's kind of like that really hot mustard sauce that always comes with Chinese take-out but nobody ever actually uses. 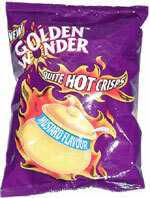 The first bite is quite good, and the hot mustard shock is no less intense as you continue to eat more chips. Good stuff! My plea to Golden Wonder: Bring these to America!